Before you start managing your secrets using Vault, the first step is to deploy a Vault cluster. Day 1: Deploying Your First Vault Cluster track is designed to help you navigate through the Day 1 operations. Read Production Hardening guide to learn about the best practices for hardening the Vault deployment in production. 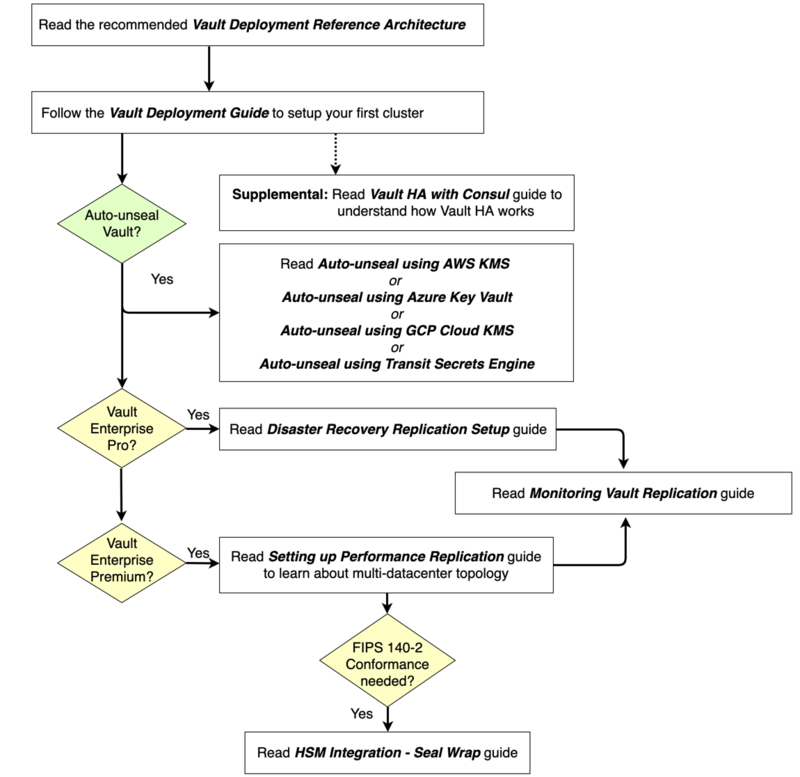 Let this guide help you make decisions about your Vault deployment and apply when possible. Vault High Availability with Consul covers similar topics as the deployment guide; however, this guide explains the Consul in greater detail. Unsealing is the process of constructing the master key necessary to read the decryption key to decrypt the data, allowing access to the Vault. By default, Vault uses Shamir's Secret Sharing algorithm to split the master key into shards. This requires a configured number of shared key holders to be present to unseal the Vault server. Refer to the Vault documentation for more details. This feature requires Vault Enterprise Pro or Vault Enterprise Premium. It is inevitable for organizations to have a disaster recovery (DR) strategy to protect their Vault deployment against catastrophic failure of an entire cluster. Disaster Recovery Replication Setup guide walks you through the steps to set up the DR replication. This feature requires Vault Enterprise Premium. When you have multiple datacenters, data replication across the datacenters can improve the overall performance. Setting up Performance Replication guide step through the activation of performance replication as well as Vault performance replication management. Also, refer to the Monitoring Vault Replication guide. If your organization cares about Federal Information Processing Standard (FIPS) to encrypt your data for security, integrate Vault with FIPS 140-2 certified HSM and enable the Seal Wrap feature to protect your data. By enabling seal wrap, Vault wraps your secrets with an extra layer of encryption leveraging the HSM encryption and decryption.